Oesterr, Ungar, General-Consulat Berlin Berlin, May 26th, 1914. H.H. Laughlin Esq. Superintendent Eugenics Record Office, Cold Spring Harbor. Dear Mr. Laughlin: I thank you sincerely for the transmission of your exhaustive and interesting reports. The far reaching proposal of sterilizing one tenth of the population impressed me very much. I wrote a review of report No.II. in the Archiv fuer Rassen - und Gessellschaftsbiologie and I shall take pleasure in[crossed out 's'] sending you a copy as soon as it appears. 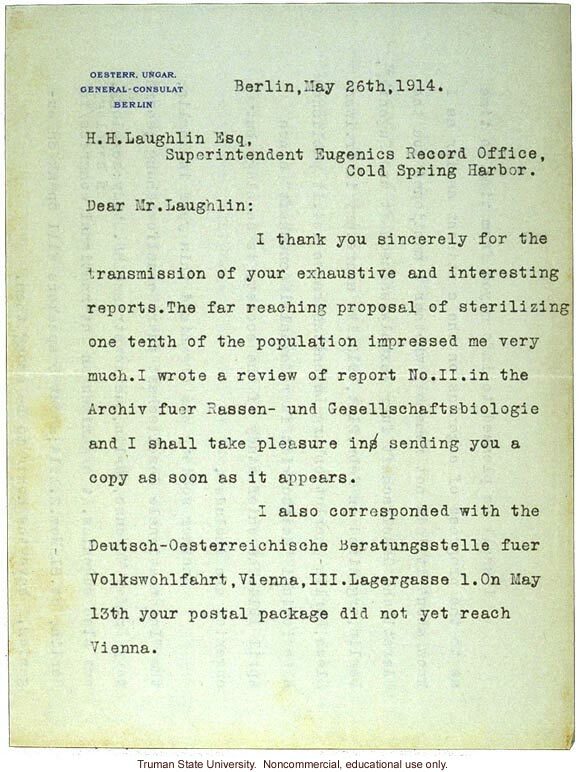 I also corresponded with the Deutsch-Oesterreichische Beratungsstelle fuer Volkswohlfahrt, Vienna, III. Lagergasse 1. On May 13th your postal package did not yet reach Vienna.